Book recounts the U.S. Navy’s fierce defense against a baffling and horrifying new weapon—the Japanese airborne and seaborne suicide attackers: the kamikazes. In the final days of World War II, ‘body crashing’ became Japan’s last ditch strategy to hold off the onslaught of America’s war machine on Japan’s home islands. So close to the end of war and a safe return home, young sailors daily faced off against an alien, yet very personal specter of death. 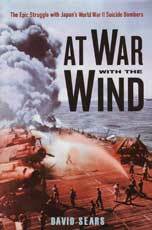 At War With the Wind was honored as a main selection of the Military Book Club and was featured as alternate selection for the History Book Club. Book has received wide editorial praise. 400 pgs, hardbound, w/dust jacket, 9 x 6, photos.